In her latest enticing collection of recipes (after Trattoria Cooking and Italy al Dente), the chef-owner of Biba restaurant in Sacramento returns to her hometown, Bologna, and its surrounding countryside. The region, Emilia-Romagna, is blessed with such delectables as prosciutto di Parma, Parmigiano-Reggiano and balsamic vinegar, which its culinary tradition prominently features. Those who can never own too many Italian cookbooks will welcome the familiar fare, including Prosciutto with Marinated Baby Artichokes in Balsamic Vinegar, a simple Mussel Salad, Caggiano and Butternut Squash Tortelli. 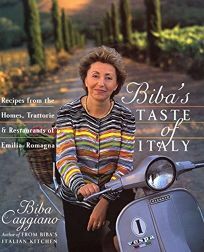 Chatty headnotes to most recipes tell where Biba discovered them and what drew her to each one, such as the simplicity of Grilled Skewers of Calamari and Shrimp from Rimini and her brother's favorite, Veal Stew with White Wine and Peas. She concludes with such sweets as Almond Chocolate Cake from a trattoria in Vignola and Mascarpone-Zabaglione Mousse from another in Frassinara. These authentic recipes demonstrate why Italian food remains one of the world's most irresistible cuisines. Agents, Maureen and Eric Lasher. (On-sale date: Mar. 26) Forecast: Caggiano has a large, dedicated following who are attracted to her motherly warmth as much as they are to her food. She will promote her new book with an appearance on CBS's Early Show the same day the book goes on sale and subsequently on Martha Stewart Living and PBS's Home Cooking, followed by a four-city tour. As before, stores should anticipate brisk sales.